The Eclipse Polychrony project provides a Signal Integrated Development Environment based on the Eclipse platform (Signal is a specification and programing language for critical/real-time embedded applications). This project, also referred to as SSME platform, includes the meta-model of Signal under Eclipse (SSME), a reflexive editor, a code editor with syntax highlighting, an Eclipse view to create compilation scenarios, the import of some other formalisms (aadl, Geneauto/simulink). The Signal Toolbox, a batch compiler for the Signal language (command line out of Eclipse), and a structured API that provides a set of program transformations. It can be installed without the other components. 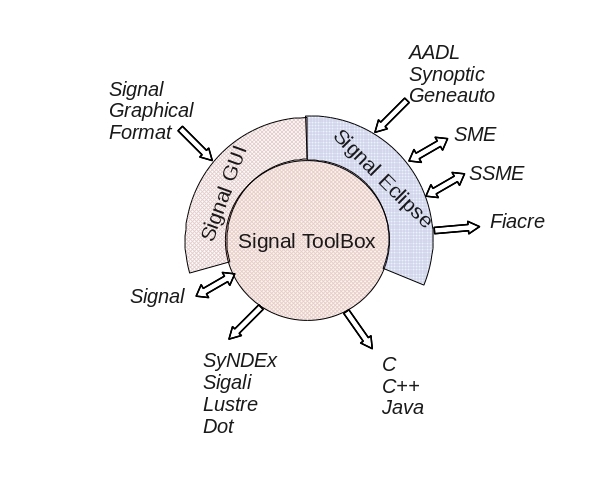 The Signal GUI, a graphical user interface to the Signal Toolbox (editor + interactive access to compiling functionalities of the Signal ToolBox). It requires the Signal Toolbox. It can be used as Signal GUI editor under Eclipse.